In a decision that will refocus the debate over burqas and niqabs, the European Court of Human Rights (ECHR) has backed the French statute that proscribes concealing one's face in public. Judges rejected a woman's claims that she has suffered discrimination and that the limits on personal freedoms are incompatible with European law. Interestingly, the ECHR downplayed valid concerns about public safety and emphasized social cohesion instead. An official statement explains that the court was "able to understand the view" that these coverings "call into question the possibility of open interpersonal relationships, which, by virtue of an established consensus, formed an indispensable element of community life within the society in question." Because the law is not targeted solely at religious dress and does not generally restrict freedom of movement, it "could therefore be regarded as proportionate to the aim pursued, namely the preservation of the conditions of 'living together.'" Objections rang out, but there is no place to appeal. Beyond affirming the status quo in France and Belgium, which has a similar law and was a party to the defense, the ECHR has reinvigorated opponents of such garb elsewhere. The government of Spain's Catalonia region quickly pledged to advance a bill as the Catalan city of Reus passed a measure of its own. Rumblings about legislation have also been heard in Austria, Britain, Denmark, and Norway. 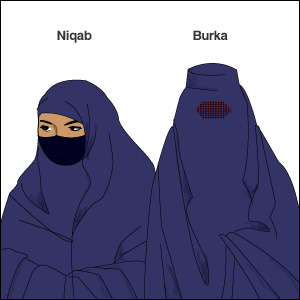 Is this the beginning of the end for Europe's burqas and niqabs? Left: The culture clash as seen in a photo from a London subway. Right: John Walker Lindh's prison duds have put him in a litigious mood. While controversies involving apparel are dominated by women's veils, men's attire also triggers disputes. "A Muslim inmate filed a class action against the Federal Bureau of Prisons, claiming that Islam prohibits Muslim men from wearing pants below their ankles, but his prison prohibits him from hemming pants above the ankles," Courthouse News Service reports. That inmate is none other than "American Taliban" John Walker Lindh. The suit contends that current policy "imposes a substantial, and unjustified, burden on the religious exercise of Mr. Lindh and all Muslim prisoners." Do not underestimate Lindh; he previously won the right to group prayers. Furthermore, St. Louis cabbie Raja Naeem is battling the taxi commission over the dress code. Naeem has been regularly ticketed for donning a kurta (billowy upper garment) and shalwar (loose trousers) rather than the standard black slacks and white shirt. Though the commission offered a compromise, color remains a sticking point as Naeem prefers white bottoms in the style of Islam's prophet. The case has not yet been resolved. "No one cares about the color of a cab driver's pants," the judge asserted at an earlier hearing, but the taxi body countered that uniforms make cabbies recognizable. And that is not the only reason to care. These seemingly trivial matters touch on a key issue: whether there is one set of rules for all or a separate set for some. The trial of Sami Osmakac, a naturalized U.S. citizen accused of plotting a wave of bombings in the Tampa area, caught IW's eye because it featured multiple requests for concessions of the type often sought by Islamists in Western courts. One was granted: permission not to rise for the judge or jury as this gesture of respect would purportedly violate his Muslim faith. Others did not fare as well. Osmakac's attorney asked for a ban on the words "terrorist" and "terrorism," which he insisted would be inflammatory, but U.S. District Judge Mary S. Scriven denied the motion, observing that Osmakac had been recorded using such terms to describe his plans for a "second 9/11." He then petitioned the court to supply Arab clothing for Osmakac because his family would not purchase it. No luck here either; Osmakac had to make do with a white linen suit. Finally, there was the biggest defeat of all: the jury's failure to accept the entrapment defense, a common response to successful FBI sting operations and one that the Council on American-Islamic Relations (CAIR) had deployed following his 2012 arrest. Osmakac was convicted and awaits sentencing in October. We hope that the prison pants are to his liking. Left: Sami Osmakac told a confidential informant, "We all have to die, so why not die the Islamic way?" Right: Should the Muslim Brotherhood be classified as a terrorist group? Several House Republicans are behind a new bill (text here) that urges the Obama administration to "designate the Muslim Brotherhood as a foreign terrorist organization." It outlines the Brotherhood's role in terrorism and calls for sanctions to be imposed on persons who materially aid "the Muslim Brotherhood or its affiliates, associated groups, or agents." Some familiar names should take note. Federal prosecutors once stated that "from its founding by Muslim Brotherhood leaders, CAIR conspired with other affiliates of the Muslim Brotherhood to support terrorists." They further pointed out that the Muslim American Society (MAS) "was founded as the overt arm of the Muslim Brotherhood in America." The government also listed top U.S. Muslim groups as Brotherhood entities in the trial of a charity that financed Hamas. Although Washington's bipartisan blindness means that the bill is unlikely to get far, the effort deserves plaudits for bucking conventional wisdom, reframing the issue, and setting the stage for future policy adjustments. With the Brotherhood continuing to push its agenda both at home and abroad, the groundwork for a reality-based approach to combating it cannot be laid soon enough.